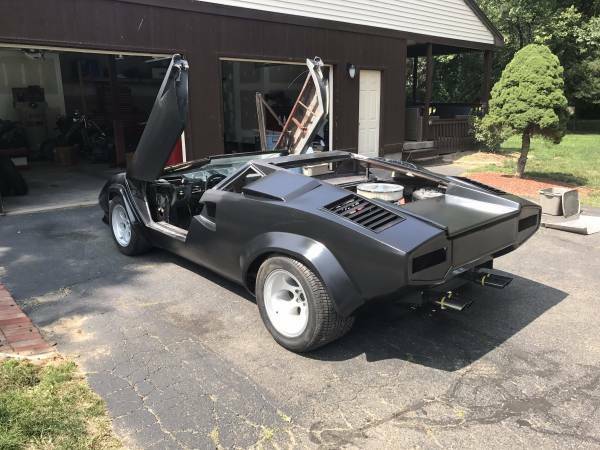 The Lamborghini Countach is widely considered a 1980's super car icon and clean examples now command upwards of a quarter of a million dollars. 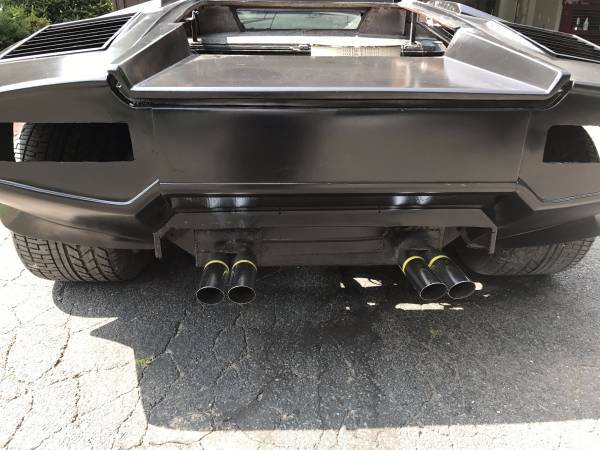 What are your options if you have a DT budget level and have the fever for Lambo doors and spaceship-like looks? The answer is found in plain sight with today's Euro Works LTD body kitted and V8 engine swapped Pontiac Fiero. The Euro Works kit looks shockingly convincing due in part to the lengthened Fiero frame which help get the proportions right. The 10k asking price does not seems too eye watering, but this mongrel is need of final assembly though it does start, stop, run, and drive. 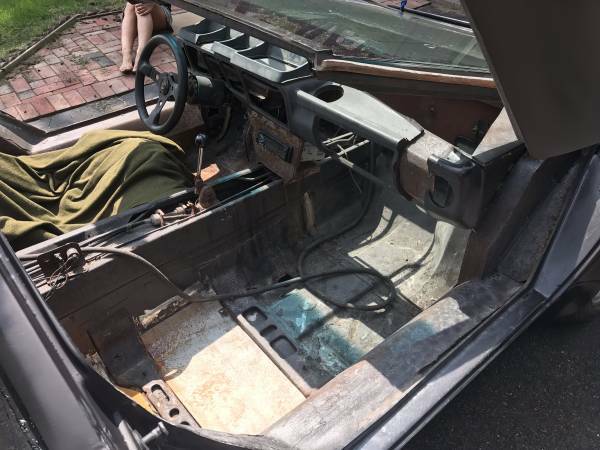 Find this 1985 Pontiac Fiero for sale in South Windsor, CT for $10,000 via craigslist. 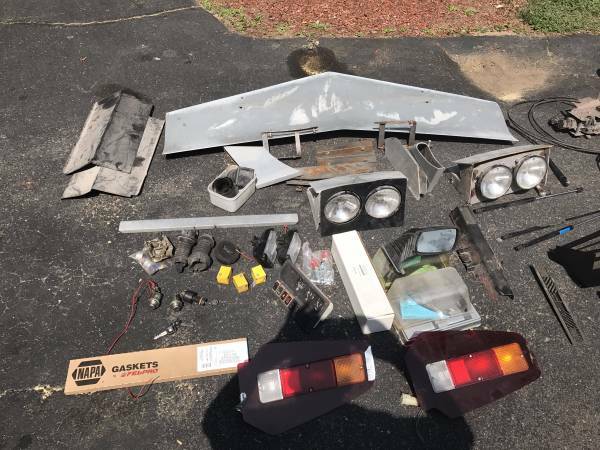 The Fiero is described by the seller as a project car that is in need of some TLC. Fresh 0 mile 350 4 bolt main Chevy with 10:1 pistons, Pete Jackson gear drive, aluminium Edelbrock Victor Jr. heads, brand new 4 bbl carb and intake, Malory uni lite distributor, Tilten mini starter, Moroso electric water pump. Centerforce dual friction clutch with V8 Archie adapter kit. The information online about Euro Works LTD is quite hard to come by, but this Chicago Tribune article on kit cars has quotes from the then owner Alan Schrager. It seems that Euro Works was sold in 2012 and no longer in operation. Here is a link to Euro Works 2009 website. Project cars like these have to be a labor of love as they can be incredibly tough to sell or price on the market. I was recently looking at a ABC Exclusive wide body kitted Mercedes 300e that needed a ton of love. I ended up not pursuing the seriously out of fear I would never be able to recoup any money put into it. Sometimes rarity and coolness do not translate into resale dollars so be wary if you are not into something along these lines for the long haul. Cory is picking up another cheapo 1995 Mercedes C36 AMG today. My wife says I'm a "finisher." I just want to finish this project... But why? These are kits you must want to keep for a long time to get your value out of them. Otherwise you are losing money and wasting time. Bummer. Nonsense. The joy is in bringing it to life, finishing it, driving the hell out of it. Then you die, and who cares about the money? Your kids ain't gonna want it anyway. "driving the hell out of it. Then you die" - you don't mean *while* driving? Looking at the oil drum sized tires on the back, the builder was going for something beefy, looking at the tread on the right tire vs. left tire, it kinda looks like its got an open diff. It might also be useful to ask the neighbors on either abutting side, how they feel about it? Being directly affected, they might have already explored some of the options. Is that a COBRA Bro?!?!? !